Last Sunday I announced the winner of my Batiste giveaway, congrats to Laura from Laura’s Beauty and Lifestyle Blog, I hope you love your prize. 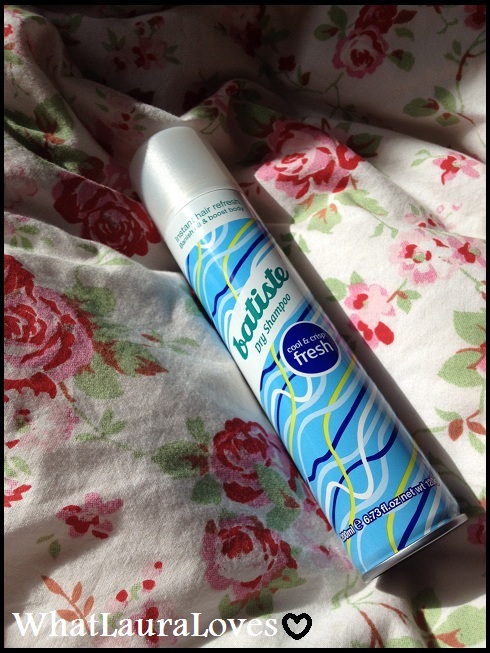 Now I’m back with another Batiste dry shampoo review and this time I’m reviewing the Fresh scent. Fresh is probably the one Batiste scent that I’ve not heard much about. I’ve tried all the others and hear people rave about the scents, particularly the latest ones which smell more like a perfume than a dry shampoo, but not much about this one. Batiste Fresh has more of a unisex fragrance than the other dry shampoo scents so it’s a good one to leave in the bathroom incase your boyfriend’s hair could do with a bit of freshening up. I’m not the best at describing scents but Batiste have got this spot on in saying that its cool and crisp. I can really smell pear in it which is really refreshing. … To hair that is revived and refreshed. Hello to happy, healthy hair. Batiste really is my favourite dry shampoo brand, I cannot recommend them any more than I already do. You can pick a can up for £2-3 from Boots, Superdrug, Bodycare, other pharmacy stores and supermarkets. What is your favourite Batiste scent? This is my favourite Batiste by far as it is so neutral, I don't feel like it interferes with my perfume. I love Batiste, I always have a can on hand as my hair gets lank quickly – Day 2 hair is a no-go without dry shampoo to freshen it up. It works so well, I sometimes use it to add body to completely clean hair too. Love it!